When you try to categorize spinners, there are a few different ways you can do this. You can do it by color or by body type, or simply by the manufacturer. I think the best way to compare is by blade shape and action. The spinner size is what determines how deep the spinner will dive and what kind of action or vibration it will have. The first kind is the narrow bladed spinner. The Mepps Aglia Long and many Rooster Tail spinners have this shaped blade. The long blade keeps the lure from diving too deep and doesn't create as much vibrations as wider bladed spinners. These are useful when the trout are active near the water's surface, preferably in slower-moving currents to give the lure time to sink. I've had only minimal success with these types of lures, but they continue to be very popular, so I might be missing something in my technique. The second type of spinner has a normal blade size and is typified by a standard Mepps Aglia spinner. 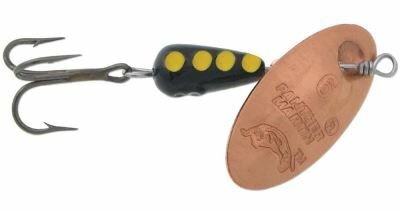 Spinners by Blue Fox and other brands have a similar blade size and action in the water. This is a great go-to spinner when you're not sure where the trout are or how aggressive they'll be. The spinners will dive deeper than those with a narrow blade and the blades vibrate more - which will spook wary fish, but may entice hungry fish more. Personally I've had considerably more success with spinners of this type than those with a narrower blade. Deep-diving spinners with a shaft-in-blade design are the third major category - they are most associated with Panther Martin lures, but Mepps also makes a model with this unusual feature. These are probably my favorite kind of lure to use - they dive deep and have an aggressive action that seems to really rile trout up. Of the three types we've covered so far, these are the ones I use the most, spinners with "normal" sized blades coming in second. When I can't get anything to work, I might break out a Joe's Flies spinner. Joe's Flies are more fly than spinner, but they have a large spinner blade that rotates through the water and really attracts fish. They are really light, so you may need to add a split shot sinker or two to cast them, but they're a nice wildcard to pull out of the tackle box when the fish aren't biting or you hung your last Aglia in a tree. All of these have proved to be effective in catching trout. You have to remember that trout in different streams will act different ways, so have a good stock of each in your vest with you, because the trout in one stream might be more wary of the vibrations from a Panther Martin, but might respond to a Rooster Tail. Also have a rainbow of colors available. We'll cover color selection in another post but be ready to switch it up when what you're doing isn't working.